It's dangerous out there. Take one of these steampunks. The last two days have been pretty amazing. Going back in time, Tears of Heaven released December 4, 2013—a little over five years ago. When the manuscript was accepted by Wild Child Publishing, I was flying high. I’d wasn’t quite 40, but I’d been a struggling author looking for a home for my story for years. When I received the email offering to put the book under contract for publishing, my feet didn’t touch the ground for several days. Since then, I’ve had some really great days and some really dark days, but nothing that really rose to the level of the first time my efforts as a writer were validated. Until these past two days. 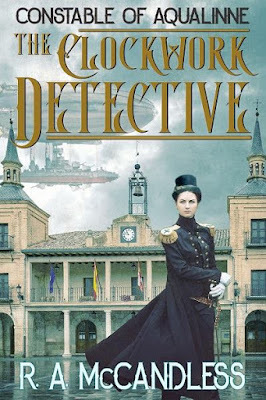 Yesterday, we revealed the cover for, The Clockwork Detective, the first book in my steampunk series: The Constable of Aqualinne. The cover we well received, and interest in the book made me downright giddy. Still in love with this cover! Today, Hell Becomes Her is available again in paperback. Technology is great, until it isn’t, and there were some weird issues in getting Amazon to actually release the book for mass consumption. But that’s over now. Over the weekend, a good friend and long-time supporter/super-fan sent me a mystery gift, which turned out to be an audio reading of the first chapter of Hell Becomes Her. It was amazing. Not just for the time and effort that went into the recording, but hearing my own words read back in a voice like fresh-churned butter over warm bread was delicious. And now I want some bread. Also, one of my cover artists contacted me this morning and said there were new models available, and that one looked like it would work for Jane. She was right! That ends months and months of nail-chewing, not finding the right model for Jane’s cover. It’s all feeling pretty good, and cumulatively, I’m floating around, walking on sunshine. Up next, a cover reveal for Sins of the Throne (A Jane Ivey Adventure) and Company of the Damned the final chapter in the Flames of Perdition series. Is there anything on this list that you want to know more about? Anything I forgot? Let me know in the comments below! Congrats, Rob. Well earned and deserved.